How often do we, as adults, set out to learn a completely new skill? I don’t mean learning how a new phone works, or becoming familiar with the latest version of an established piece of software – I mean learning a skill unlike the ones we already have. Possibly not very often if you’re at all like me. Considering how refreshing learning a new skill can be, especially if it’s learnt for pleasure rather than for work, this tells me lots of us are missing out on a real pleasure, and possibly on new life chances too. Jenny and I have been thinking about this recently and decided that we would set out to gain some new skills by attending courses in art forms completely new to us. We’d like to offer a wider range of classes at our studio-gallery and that’s part of our motivation to look for new skills. Since that point (about 18 months ago) we’ve progressed a fair distance in our desire to develop our capabilities as glass fusers, for instance. In fact, our beginner’s classes in glass fusing (which we ‘Fusion-Inclusion’ as we focus on using inclusions to make fused glass art) have become our 3rd most popular class, right behind our stained glass beginners’ classes. We’re at the point now that our starter kiln is pretty much fully used all the time and the capabilities (and cost) of a larger kiln is often on our minds. Another one of these new skills is to be the subject for future classes at Vitreus Art and I’m keeping our powder dry on this one! Suffice to say we set out on a certificated course to gain an appreciation of how the art-form ‘works’ and to figure out if we could build our proficiency to a level that would enable us to teach our own students in time. Of course we don’t expect to be brilliant straight away, but we flatter ourselves that with practice, plenty of ideas to experiment with and recourse to our organisational and planning skills we’ll be able to put on a good show when we feel we’re ready. We’ve enjoyed (and learned from) the process of following a structured teaching environment too – it’s not all about the new skill, some of the learning has been about the process of learning! 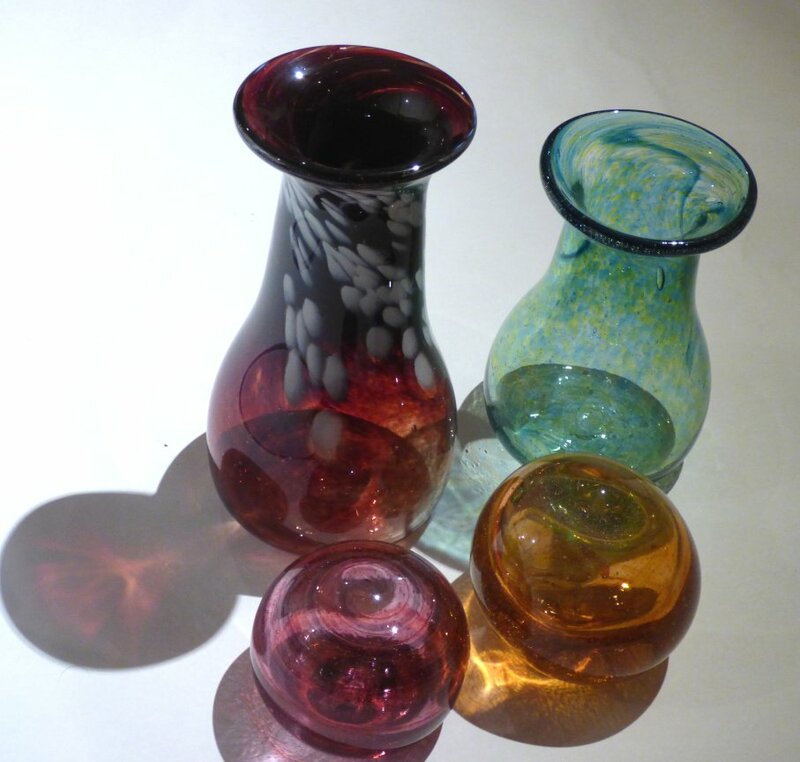 And more recently we tried something even more removed from our present artistic activities – glass blowing. We set out with no expectation that we would ever want to blow glass on our own. This was purely for pleasure and to satisfy an urge Jenny has nursed since seeing glass makers on the Venetian island of Murano where some of the world’s most accomplished glass-blowers make their magic. And what a blast it was! We chose to attend a one-day introduction to glass blowing at ‘The Glass Hub’ near Bath, in the UK. One of several creative businesses located on a farm complex, the whole place feels like it’s dedicated to artistic endeavour, which is a stimulating environment to learn in – no adult-education at a formal college feels like this! Glass blowing is hot, potentially dangerous, exciting, and a little scary. In stark contrast to much of our own glass work, glass-blowing is very much ‘in the moment’ – things happen quickly, glass heats and cools rapidly, the processes need to be timed carefully. Our tutor Dylan was at pains to apologise for seeming to bark instructions at us but we understood perfectly why that was – something needs to be done – re-heating the glass, rolling it, shaping the molten glass, blowing air in to the embryonic vessel – and there’s little time for thinking, it’s all about action! The end results were (to be completely candid) not perfect! We watched Dylan and his colleagues effortlessly melting, shaping, colouring all manner of beautiful blown glass vessels and then made lumpy, uneven attempts of our own. But we love what we’ve made, and we loved every minute of the process. It’s fast moving, sweaty and challenging, but the emotional high of making something recognisably like a glass object from scratch is powerful. The patience and skill demonstrated by our tutors, their delicately timed interventions, and the humour of the whole class left us a bit breathless and a lot excited! Now we understand the ‘high’ our own students have told us about – learning new skills, the pleasure of owning a piece of art you’ve made, the collaborative experience of working with craftspeople to create something long-lasting – we’ve felt it and we always hope to deliver that same feeling in our own studio. From now on we’ll be thinking a lot more about how we can spread that pleasure – it’s not just about making something, it’s about discovering that our hands can achieve results we hadn’t imagined, and enjoying the distinctive pleasure of learning new skills. What sort of art-form would you like to try that’s new to you? How would you like to learn a new craft skill and discover what your hands can achieve? You could do worse than having a look at the classes and courses we run at Vitreus Art. We’ll help you discover tghe pleasure of learning something new!